In Florida, a formal administration probate is the most common way that a decedent’s larger estate is administered to beneficiaries. The Jacksonville probate attorneys and Ponte Vedra Beach probate lawyers at The Law Office of David M. Goldman PLLC handle cases of formal administration probate in Jacksonville, Florida’s Duval County and the surrounding areas including St. Johns and Clay County. As most uncontested probate proceeds are handled online, the probate lawyers also handle probate cases around Florida. Florida law does not always require a formal probate administration. Under certain circumstances, an estate can qualify for summary administration. A summary administration is a shortened form of probate in this state that does not require the court to appoint a personal representative. There are two ways an estate may qualify for summary administration. Either the decedent has been dead for more than two years, or the value of the probate estate, the entire estate subject to administration, does not exceed $75,000. It is important to note that some assets are not subject to probate. The following assets are often not subject to probate: life insurance, retirement accounts, stock accounts, bank accounts and even one's primary home is not usually subject to probate. However, a summary administration is unavailable even if the estate meets one of these requirements if the decedent had a valid will that specifically orders for a formal probate. In most of our Jacksonville probate cases, unless the estate avoids probate through a revocable trust, the decedent's Florida estate must go through the formal probate process. In Jacksonville, Ponte Vedra, and many other probate courts in Florida, the probate judge will closely supervise the administration of the estate, and the process goes through three stages: opening the estate, administering the estate, and closing the estate. The first step in opening a probate in Jacksonville is to file documents with the court to open the probate. This usually occurs after an interested party, often a beneficiary of a Jacksonville probate estate hires a probate attorney to prepare the probate documents. Once our Jacksonville probate attorney takes these preliminary steps, the lawyer will then file a Petition for Administration along with some related documents to the appropriate probate court. After the estate is open, the probate court will appoint a personal representative or executor to act on behalf of the estate. The probate judge in Jacksonville or St. Johns County will review the file and issue the letters of administration. These documents give the personal representative the power to move forward and begin the probate process. The personal representative of a Florida probate case can begin administering the estate once the probate court issues the letters of administration. Most of the probate process in Florida takes place after the personal representative is appointed. Often first step the personal representative in Florida is to notify the estate’s creditors. The notice sent to the creditors will contain identifying information about the estate as well as inform potential creditors of their right to make claims. All known creditor must receive this notice. The personal representative in a Florida Probate case must also gather or collect the estate’s assets for safe keeping. This responsibility provides the personal representative must account for all the assets and must also account for the assets. This responsibility to account means the personal representative must create an inventory of the assets. The personal representative must also collect any outstanding debts owed to the decedent. The personal representative does have a lot of other duties as well, and this list on this page is by no means exhaustive. The personal representative must process claims from creditors and prepare any objectives to claims if they are needed. This person must also pay estate taxes and determine fees for anyone that provides a service to the estate. In Jacksonville and with most Florida probate courts the estate will be closed once the time for creditors to submit claims ends, or when any claims against the estate are settled. The probate assets must be ready for distribution, and the personal representative has paid all taxes and fees. Once these steps are taken, then the probate attorney can file a petition with the court. The judge can then approve the petition, and will then distribute the assets to the beneficiaries. Most top Probate attorneys in Jacksonville will tell you that it is not uncommon in Jacksonville for a Formal Administration to take six months or more to complete. In some probate cases in Jacksonville, the process can take more than a year. 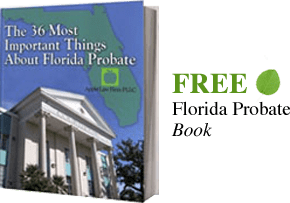 If you have additional questions about the cost of a formal probate please take a few moments and and request our Florida Probate Intake Form. If you need help with a Florida Formal Administration Probate for an individual or a family member who resided in Florida or had real property in Florida at the time of their death CONTACT our Florida Probate Lawyers by email or call us at 904-685-1200 to discuss your situation today.